Preheat oven to 450°F. Lightly coat two large-rimmed baking sheets with cooking spray. 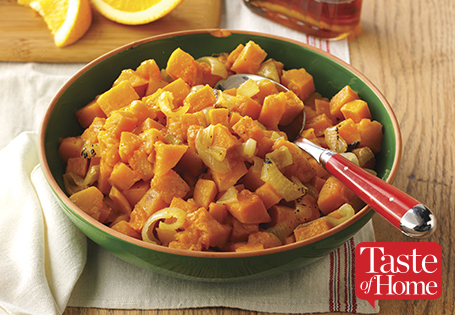 Combine the squash, onions, oil, salt, pepper and cumin in a large bowl. Divide mixture between the two baking sheets. Place the vegetables into the upper and lower third of the oven. Roast 15 minutes, then stir and rotate the pans up and down and front to back. Continue roasting until vegetables are lightly browned and tender, 18-20 minutes longer, stirring once. Remove from the oven and transfer to a large bowl. Meanwhile, combine the orange juice and maple syrup in a small saucepan. Bring to a boil over medium heat. Cook, stirring occasionally, until reduced to a syrup that is thick enough to coat the back of a spoon, about 5-6 minutes. Remove from the heat and swirl in the butter until melted. Stir in the grated orange zest. Pour mixture over the vegetables, toss well and serve.